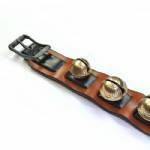 This strap features 13 petal bells graduating in size from 1 1/8" bells at the ends to a 2" bell in the middle. The laced strap is about 41"long from buckle to tip and is done in a striking two-tone using black and chestnut (rust) leather. The finished strap is 1 1/2" wide in the center, tapering to 7/8" at the ends. The original steel buckle still had plenty of life and was reused on the new strap.